The Upcoming Events Widget displays upcoming events from specific calendars and audiences in Rock RMS. Any combination of calendars to display events from. Filter which events are shown by selecting specific audiences. Is there a repeating event that you’d rather not show? Just select it here and it will not be displayed. Allows you to show/hide a link to your Calendar page. 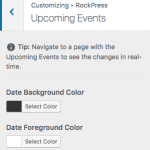 In the Customizer, you can specify both the background and foreground colors for the event dates.